Picked this issue of SUPERMAN up at my trusty 7-11. It was the final chapter in a four-part epic that I remember really enjoying, though its age is showing a bit around the edges as i look back at it. 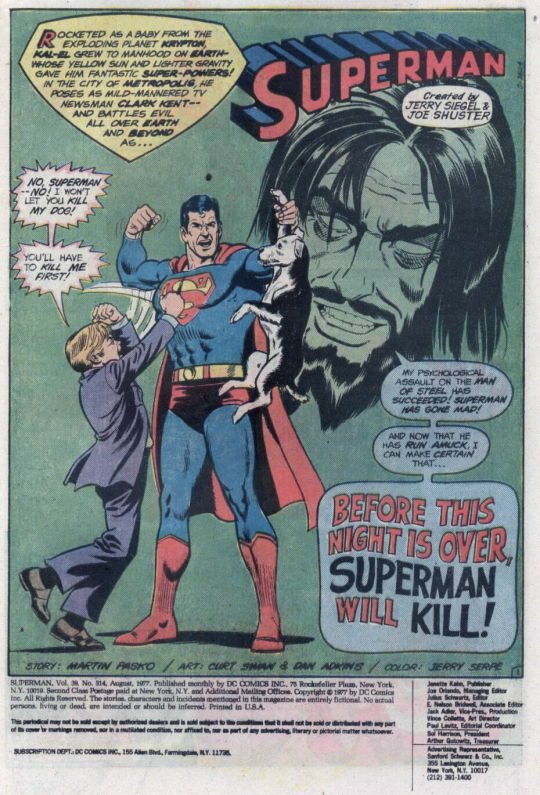 The cover was a collaboration between Superman mainstay artist Curt Swan and industry powerhouse Neal Adams. but while Swan and Adams had worked well together elsewhere, I’m not really fond of this one. Adams’ more realistic rendering fights the more pastoral aspects of Swan’s composition here. One element I do like is the cover copy lettering, which is well-integrated into the image in a satisfying and complementary way. So where we left off previously was this: the space-pirate Amalak had unleashed a deadly plague at the journalists convention in Central City attended by Clark Kent and much of his supporting cast. 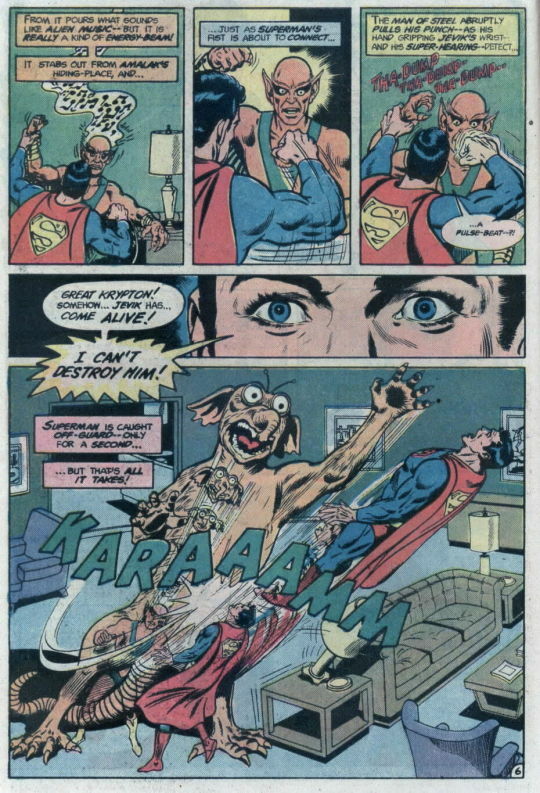 The source of this plague was an alien creature, Jevik, who spent most of the adventure disguised as a stray dog adopted by Steve Lombard’s nephew, Jamie. Now, Jamie sees the man of Steel threatening his beloved pet, and he moves in to intercede on the animal’s behalf. It’s all part of Amalak’s plan to force Superman to take a life, thus breaking his code against killing and destroying him,. 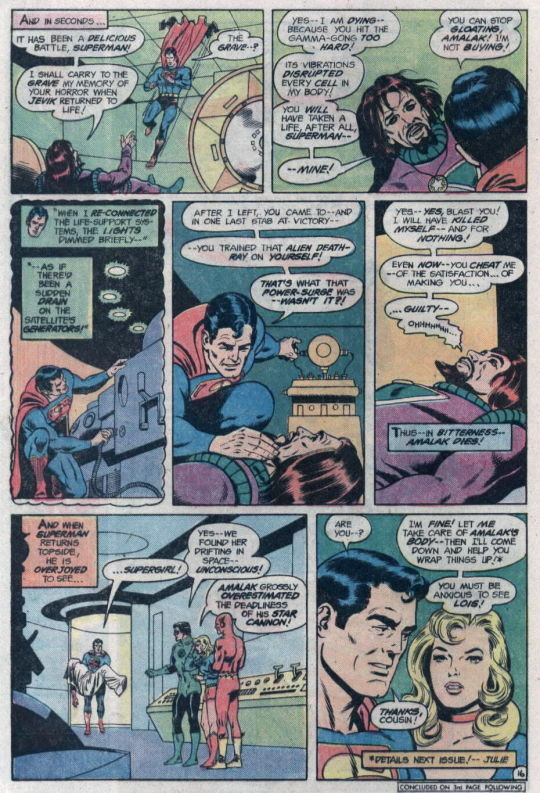 As Superman struggles with his decision, Jamie contracts the Journalist’s Plague himself and passes out. 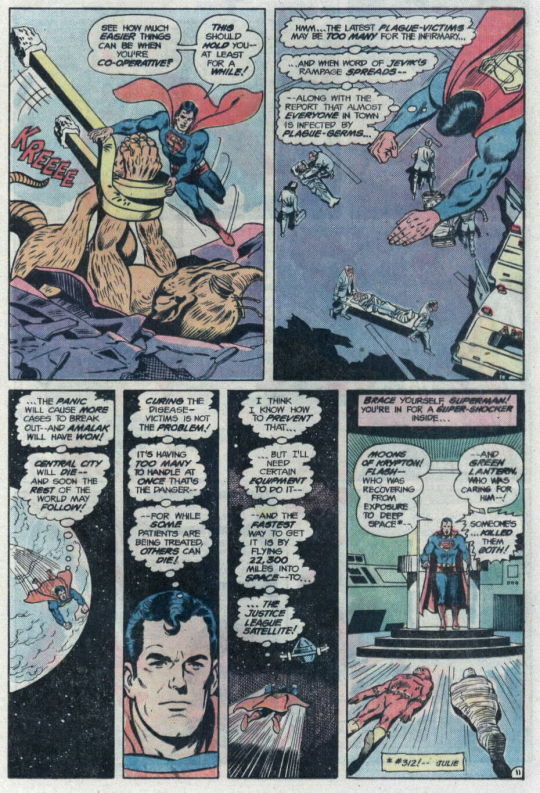 Superman explains to Steve Lombard that Jevik isn’t alive–there’s some nonsense about the life-cycle of the creatures from Jevik’s world, but it’s really double-talk to allow Superman to extinguish Jevik’s existence while still being within bounds. And it might have worked out, if Amalak didn’t take that moment to play a sonic signal that transitioned Jevik from its dormant “dead” state to its living state–and the now-revived Jevik attacks the Man of Steel. Jevik goes on the rampage, attacking a local Mactavish’s restaurant (the Metropolis equivalent of a McDonalds) in his hunger. Superman doesn’t want to hurt the beast, and he ends up restraining the creature with the restaurant’s golden arches sign. But the plague has now been spread more widely. Superman’s got an idea of what to do, though, and he takes off for the Justice League satellite. Entering, he discovers the Flash and Green Lantern already laid out–Amalak has invaded the JLA Headquarters. Superman returns to the JLA satellite to find Flash and Green Lantern recovering, and they’ve also recovered Supergirl, who was floating unconscious in space from the preceding issue. 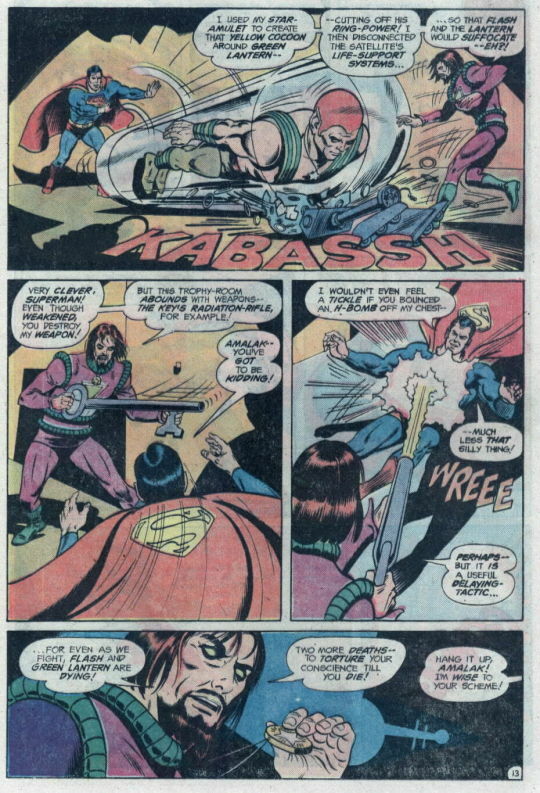 But Amalak is on the cusp of death, Superman struck the Gamma Gong too hard, and so the space-pirate has gotten him to kill after all. Not so, says Superman! He observed a power drain earlier during te fight, during which time Amalak turned an alien death ray on himself, hoping to implicate Superman. And so, Amalak dies unfulfilled–and I don’t think he ever came back from this death, which is something of a shame as I liked him as a character. And then we come to the best sequence in the book, the epilogue. 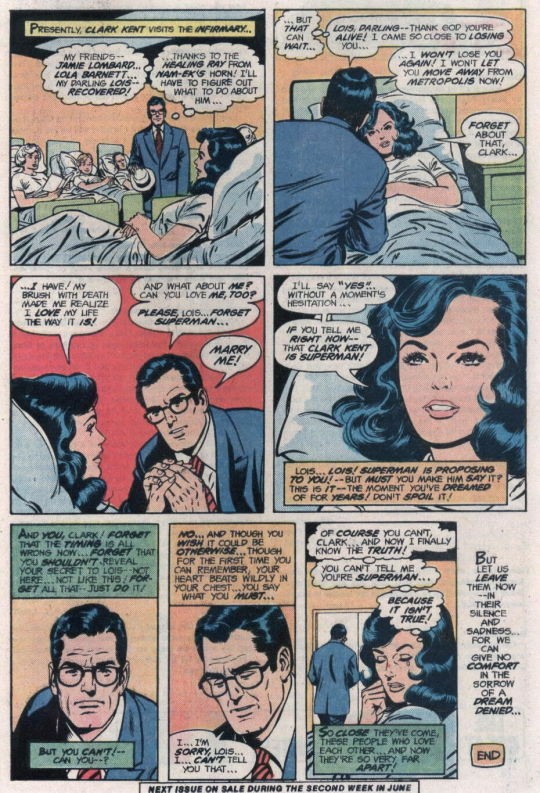 It’s a great emotional sequence in which Clark Kent, relieved that Lois will recover from the disease and not wanting her to relocate to her new job in Central City, proposes to her. In typical Lois fashion, she tells Clark that she’ll agree if he reveals to her right now that he is really Superman. And even under these conditions, Clark just can’t do that, even though it’s true. And so he walks away–and Lois now believes that it isn’t true. So close, and yet so far. 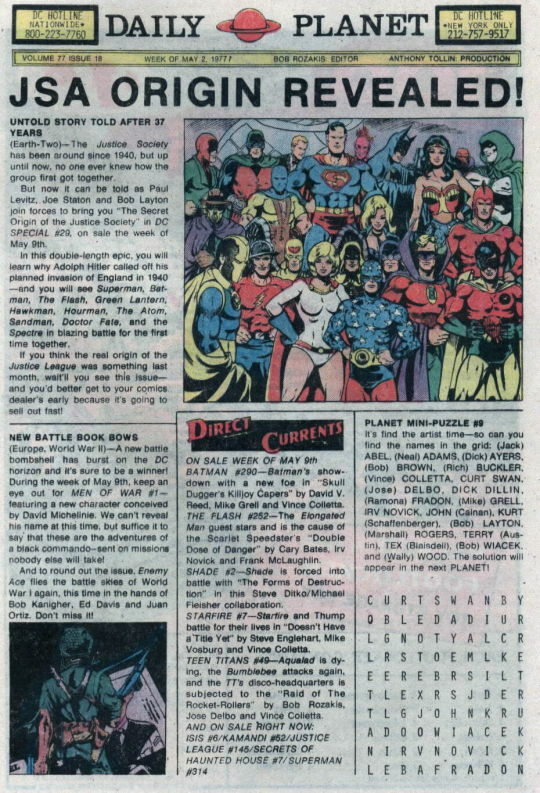 It had been teased in an earlier issue of ALL-STAR COMICS, but the Daily Planet promotional page in this issue let me know in no uncertain terms that the next week the origin of the Justice Society of America would be revealed for the first time in DC SPECIAL #29. Especially coming off of the origin of the JLA that I’d read about a month previous, I was hot to get my hands on this book.